Thunderbolts Forum • View topic - Are there any EU followers here with physics degrees? Are there any EU followers here with physics degrees? Re: Are there any EU followers here with physics degrees? celeste wrote: Let's look at our "fudge factors", in the gravity only model. We have dark matter, which is our diffuse source of gravitational attraction. We have black holes, which is the compact source of gravitational attraction. We have dark energy, which is the diffuse source of expansion. And to round out the set , we have quasars, which are the effective point sources of energy. What? Quasars are definitely not point sources of energy. Maybe you mean apparent point sources, since angular sizes are small at great distances? But, in that case, all stars would also be “point sources of energy,” so why single out quasars? Those are much larger than stars in intrinsic size. Do you know what a quasar is? Also, black holes are only one form of compact object, and every object with mass gravitates, not just black holes. So here is what we should have asked: Are there situations where we have faster rotation than can be explained by the amount of "baryonic matter" present, but where a "black hole" is too compact, or dark matter too diffuse? How would a black hole be “too compact” to cause a gravitational effect? The gravitational field of an object depends on the mass of the object, not the size. I don’t think you actually have a degree in physics. This is literally the first thing one learns about gravitation. Every problem you do involving gravitation uses this fact. To make that clearer, we "knew" there was a black hole in the center of our galaxy, and the rotation of stars near G.C. could supposedly be explained by that hole. On the other hand, we have galactic rotation, which could supposedly be explained by a dark matter halo. But what about objects like Gould's Belt, where neither dark matter nor a black hole would work? First of all, every object with mass in the Milky Way contributes to the orbital velocity of the objects outside of that region. It is the total mass enclosed in an orbit that determines what gravitational force is felt by an orbiting star at that orbit. You very clearly have not taken much physics. Secondly, why would the Gould belt in our galaxy not be explained by these things? Those stars orbit the same mass that every other star at those orbital distances orbits. If you knew anything about physics, this wouldn’t be perplexing to you. Here is the problem, (and I'll speak as my mainstream education would dictate): We are surrounded by a ring of stars, which seems to be rotating as a ring, all around us. Umm, no. The stars near the sun do not go around the sun. All of the stars in our stellar neighborhood orbit the Milky Way, just like the sun does. But we can't have dark matter out there around the ring, since we've already ruled out any significant dark matter being in the solar neighborhood, (galactic rotation curve for the Milky Way gives us only a few solar masses per cubic parsec near the sun). A few solar masses per cubic parsec would seem like a small amount to you?? The nearest star to the sun is about a parsec away. The sun has a mass of one solar mass. You’re saying there are a few solar masses per cubic parsec. So, in other words, there are a few stars worth of mass in the space between stars? That would definitely be significant! The density of the ISM is only about one particle per cubic cm, or about 1/100 of a solar mass per cubic parsec. So, according to you, dark matter would have to make up hundreds of times the mass of the ISM, but that's insignificant? You clearly have no idea what you are talking about. It's interesting how Aardwolf is just completely absent after his idea about galaxies not rotating was shown to be utter nonsense. Are we not going to hear anything else from you, Aardwolf, or are you just waiting until everyone has forgotten about your ridiculous and demonstrably incorrect claim so that you can participate again without shame? Michael Mozina wrote: A highly ionized 'stationary' particle would still "cool off" by emitting photons. Please show how you think an isolated electron can emit a photon. Higgsy and I were discussing the various ionization states of *ions*, not electrons. I was describing hypothetical stationary highly ionized ions, not electrons. Are you going to answer any of my list of questions? Doesn't it bother you in the least that with all that education in physics you have, that you're reduced to using placeholder terms for human ignorance to describe a whopping 95 percent of your cosmological belief system? Doesn't it concern you at all that electric fields don't play a more prominent role in your descriptions of events in plasma and you still can't produce a full sphere corona in a lab based on 'magnetic reconnection"? Don't you think it's more likely that a *known and demonstrated* cause of photon redshift in plasma is more likely than a hypothetical cause? Isn't it a tad uncomfortable to have blown several billions of dollars trying to find evidence of exotic matter and to have come up empty, while the standard particle physics model has passed every test? I'm really trying to understand why you think that any theory which remains ninety five percent undefined is in any way superior to plasma cosmology theory? All I have to be able to do is fully empirically explain 6 percent of the function of the universe with EU/PC theory and I'm ahead of you. I can even start with the sun's full sphere corona since that seems to be your physics Waterloo. Last edited by Michael Mozina on Wed Aug 09, 2017 2:43 pm, edited 1 time in total. And Higgsy? .. "schooling" people on the laws of Thermo-dynamics? But these Laws of TD are somehow different when applied by Astronomers? ... how does that work? What is the 1st Law of Thermodynamics? The First Law Explained! What is the 2nd Law of Thermodynamics? The Second Law Explained! What is the 3rd Law of Thermodynamics? The Third Law Explained! Michael Mozina wrote: Higgsy and I were discussing the various ionization states of *ions*, not electrons. I was describing hypothetical stationary highly ionized ions, not electrons. Ok, then please show how you think an isolated proton (a hydrogen ion) can emit a photon. Bob_Ham wrote: Do you know what a quasar is? You effectively disappeared after I asked you and Higgsy about helical filaments and rotation curves. BeAChooser wrote: Do you, Bob? Really? How can you be sure, Bob? Looks like Bob ran away. But since he’s now claiming CERTAINTY, I have a few questions for him. ONE. Just how does he explain quasar jets? Without resorting to gnomes, I mean? A recent mainstream article (http://www.astronomy.com/news/2015/05/h ... k-hole-jet ) admitted that “Such extragalactic jets are not well understood.” Can he be that honest or will he insist that he’s certain how it works? TWO. Why are the rotation axes in a sample of quasars spread over distances of a billion light years parallel to each other? That was the conclusion of astronomers/astrophysicists with the ESO’s VLT in China: http://www.eso.org/public/usa/news/eso1438 . As that article notes “’The alignments in the new data, on scales even bigger than current predictions from simulations, may be a hint that there is a missing ingredient in our current models of the cosmos’ concludes Dominique Sluse.” What do you suppose that missing ingredient might be, Bob? I’ll give you three guesses. THREE. How can Bob even be sure that quasars are distant objects? Redshift? But that assumes redshift can only be caused by recessional velocity … and thus associated with distance in the Big Bang model. But experiments now show that there are other causes of redshift. In fact, electromagnetic energy passing through plasma has been experimentally shown in labs on earth to exhibit redshift. As a result, he can’t really be sure of the distance or power output from quasars. As a further indication of this, I wonder how he explains observations that suggest quasars are much closer than the mainstream *degreed* physicists think? How does he explain observations that suggest they are associated with another? For example, here’s a quasar quartet: https://phys.org/news/2015-05-astronome ... uasar.html that in the words of the article has astronomers “baffled”. They found four active quasars that are not only in close proximity but all in a line: http://www.keckobservatory.org/images/b ... 72dpi1.jpg . Imagine that! Can you explain how black holes do that, Bob? Halton Arp had a possible explanation. Care to comment on that? Here’s an Arp discovery … one reported in Astrophysical Journal in 2004, where a quasar is seen in front of galaxy NGC 7319, right near its Active Galactic Nucleus. The arrow points to the quasar: https://upload.wikimedia.org/wikipedia/ ... C_7319.jpg . The redshift of the galaxy is 0.022, denoting a distance of about 360 million light years. But the quasar’s redshift puts it at a distance thirty times farther. Are we really to believe that we can see that quasar through the heart of that galaxy? And notice that there is a jet emanating from the AGN and the quasar is lined up with the projection of that jet: http://www.haltonarp.com/articles/from_ ... C_7319.jpg . Just a coincidence, Bob? Or how about this one? http://discordancy.report/wp-content/up ... _rband.jpg shows 2 quasars the just happen to lie directly on a filament connecting NGC7603 and it’s companion NGC 7603B. What is troubling is that all four objects have very different redshifts supposedly corresponding to very different distances … but all four are aligned with a filament that appears to be connecting NGC 7603 and NGC 7603B. The red shift of the filament is that of NGC 7603. The authors of a 2004 paper … http://adsabs.harvard.edu/abs/2004A%26A...421..407L … calculated the probability of three background galaxies of any type being randomly projected on a filament of a fourth galaxy at 3 BILLION to 1. And, furthermore, as the linked abstract of that paper states, the “detection of very vigorous star formation observed in the HII galaxies of the filament would have a low probability if they were background normal-giant galaxies; instead, the intensity of the lines is typical of dwarf HII galaxies.” So the probability of this is even lower than 3 billion to 1. In the paper, the authors conclude that non-cosmological redshift couldn’t be rejected. They considered the hypothesis of galaxies ejecting new matter (as proposed by Halton Arp) and thought it fit the system very well. In the end, they favored the ejection hypothesis because it explains the low probabilities in the system. What say you, Bob? And I could go on and on and on showing you observations like that, Bob. FOUR. How does Bob justify completely ignoring the explanation for quasars that was put forth by Eric Lerner and what the simulations done by Anthony Peratt of interacting galaxy sized filaments showed? They provide an alternative to what he thinks quasars are and unless he can effectively debunk what they propose, his certainty is arguably premature. Or are you simply ignorant of these things, Bob? And if you are ignorant of them, how again can you be sure you know what quasars are? Read this article, Bob: http://phys.org/news/2015-08-astronomer ... osmic.html . It’s about a pair of closely associated protogalaxies that each have a quasar. I find it interesting for a number of reasons. First, notice that the word “plasma” is not mentioned anywhere in it. Again, just “gas”. Talk about astrophysicists putting blinders on … STUCK ON STUPID. Second, notice that they label the gas “cold” but that’s a misnomer. It isn’t “cold”. It’s at 10000+ C. Because it’s not a neutral “gas”. It’s a PLASMA. It’s a fourth state of matter and one that acts quite differently than ordinary cold gas. STUCK ON STUPID. Third, notice that they are finally admitting the existence of huge intergalactic filaments in the current AND past universe and are now connecting huge filaments of plasma (not "gas") in the intergalactic medium to the formation of galaxies … something that plasma cosmologists predicted 40 years ago. STUCK ON STUPID. And now, fourth, they even have a picture of those filaments connecting the protogalaxies. But they still can’t see the obvious. Bob, look closely at the following image: http://cdn.phys.org/newman/gfx/news/hir ... hastro.jpg . You can click on the link I provided to blow it up even bigger. If you do, you can clearly see that there isn’t just a single filament of "gas" connecting the two quasars. There are clearly TWO filaments running into the left most quasar and out of it towards the right most quasar. And if you look carefully at the filamentary structure between the two quasars, you can see that the two filaments are helically wound. This is just as predicted by the plasma cosmologists for the formation of galaxies from plasma filaments carrying Birkeland currents. Here’s a graphic (http://www.holoscience.com/wp/wp-conten ... galaxy.jpg ) depicting the plasma cosmologist’s (electric universe) model of galaxy formation from YEARS AND YEARS ago. 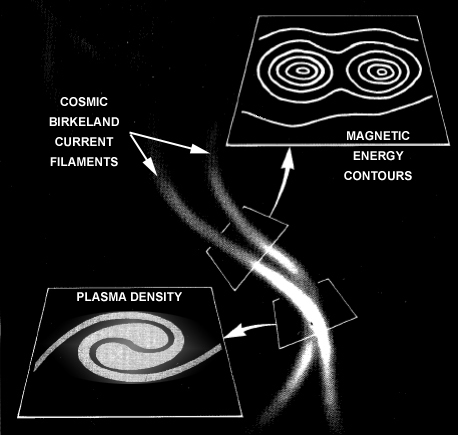 Plasma cosmologists (Alfven and Lerner, in particular) said quasars occur when two intergalactic current carrying plasma filaments interact and wind themselves helically together thus jump starting a homopolar generator with a plasmoid at the center where all the current flowing as a result of the rotating magnetic fields is concentrated, releasing vast amounts of energy as the system further collapses due to gravity. Now this was written at a time when most astrophysicists were still denying that there were large intergalactic current carrying plasma filaments (which we now know is true). The mainstream astrophysics journals rejected Lerner’s scientific papers on this subject, dismissing the analogy between galaxies and plasma focuses (which were being tested in labs at the time by the way) as absurd. Only when his papers were resubmitted to a small plasma physics journal did they get published. Here’s one of those papers: http://bigbangneverhappened.org/Magneti ... No%201.pdf . You can clearly see how prescient Lerner (and Alfven) were ... and how blind the mainstream astrophysics community has been for more than 30 years since. It's pathetic what modern astrophysics has become. Literally STUCK ON STUPID. Also, notice that the http://phys.org/news/2015-08-astronomer ... osmic.html paper says “Once the gas merges with the disk inside the dark-matter halo, it is pulled around by the rotating gas and dark matter in the halo. … snip … Galaxies are thought to form within extended halos of dark matter.” So once again, we see the astrophysicists have to fall back on a combination of magic gnomes to explain observations that plasma physicists explained decades and decades ago (a fact that so far I can’t help but notice you’ve ignored). Even as they make the above claim, observations are indicating that the halo isn't made of exotic dark matter but ordinary matter ... plasma, in fact. And still they don't see the obvious. STUCK ON STUPID. FIVE. Here’s a strange observation, Bob …. http://www.popsci.com/scientists-find-d ... rby-quasar . Apparently astronomers have quasar with (according to you *degreed* gnome experts) two black holes inside it. And it just happens to be the quasar closest to earth! An guess what else? They’re predicting that these two black holes are going to collide in just a few hundred thousand years. How lucky can we be? Seriously, what are the odds of Homo Sapiens ... who have only been on earth 200,000 years or so, and only technologically capable to study the universe a few hundred years ... just happen to see a very rare object that will be gone in a just hundred thousand years ... in the nearest quasar to them. Well, Bob? SIX. Here’s an even stranger discovery from back in 2010. https://phys.org/news/2010-04-discovery ... ifies.html “The phenomenon of time dilation is a strange yet experimentally confirmed effect of relativity theory. One of its implications is that events occurring in distant parts of the universe should appear to occur more slowly than events located closer to us. For example, when observing supernovae, scientists have found that distant explosions seem to fade more slowly than the quickly-fading nearby supernovae. … snip … However, a new study has found that this doesn’t seem to be the case - quasars, it seems, give off light pulses at the same rate no matter their distance from the Earth, without a hint of time dilation.” Now I’ve searched the web and haven’t found an explanation by the mainstream for this. So tell us, *degreed* physicist … can you explain that to us? It seems to be yet another observation that the big bang/gnome supporting community have just swept under the rug as *inconvenient*. But then again, maybe you have sources we don’t? Or perhaps it means that quasars aren’t nearly as far away as you folks have claimed? Hmmmmm? Nice post, BeAChooser. In some cases, like Bob's, you can substitute "degreed" with "indoctrinated." I respect the training, but it is all for naught if it is not used per the scientific method—which includes self-correction. The general public knows about the Sun as a self-gravitating ball of gas, the Big Bang, and even the billions of years the Earth has been around because those things have been repeated until they became true. What most outside the professions do not understand is how tenuous those assumptions and "best guesses" are. I'm guessing a lot of pros don't know that either, otherwise they would not be so stubbornly flummoxed when new observations throw a monkey wrench into the works. "Gee, that idea must be (Gasp!) wrong!" Bob_Ham wrote: Ok, then please show how you think an isolated proton (a hydrogen ion) can emit a photon. FYI, our discussion was related to various kinetic energy states of highly ionized ions, not about electrons, or even bare protons. Our conversation would apply to oxygen ions at different (high) ionization states, iron, carbon, etc. In such instances of highly ionized ions, even spontaneous emissions would apply. Interactions with photons could have an effect on the ionization state. The more highly ionized ion would be more highly charged and more attractive to other electrons too. They therefore have unique energy states and properties depending on the ionization state itself. The bottom line is that more highly ionized ions have a higher internal kinetic energy state than less ionized ions of the same element, even if we could keep them from otherwise moving in the x,y,z axis, or even if they are moving at exactly the same speed. Are you ever going to answer my last few questions or is this a one way conversation we're having? Michael Mozina wrote: Are you ever going to answer my last few questions or is this a one way conversation we're having? Ya, he comes across that way to me as well. "All hail the dead inflation deity, the creator of the almighty big bang". Something about a pot and a kettle comes to mind. Ad hominem attacks are not acceptable here. Your post and a response have been removed.